New comics Monday, Wednesday, and Friday! I lost some readership back when I was on a World of Warcraft binge, and decided to avoid writing strips that were too specific. But seeing as how Grand Theft Auto IV took in over half a billion dollars of sales in just one week, I figured the audience was wide enough to indulge myself with an ode to Brucie. His complete and total obliviousness to his own ridiculousness is amazing. I actually did pick him up to go drinking on a motorcycle. This never bothered me with any of the other male characters, but Brucie's stupendous overcompensation gave me a disquieting tension as he was hanging onto me. Rockstar did an amazing job with Grand Theft Auto IV. The fact that I could read that much into a character while simply taking a motorcycle trip speaks volumes. I'm shooting to have a review up by Wednesday, but in all honesty, I'm finding it difficult to gather my scattered thoughts about this sprawling game. 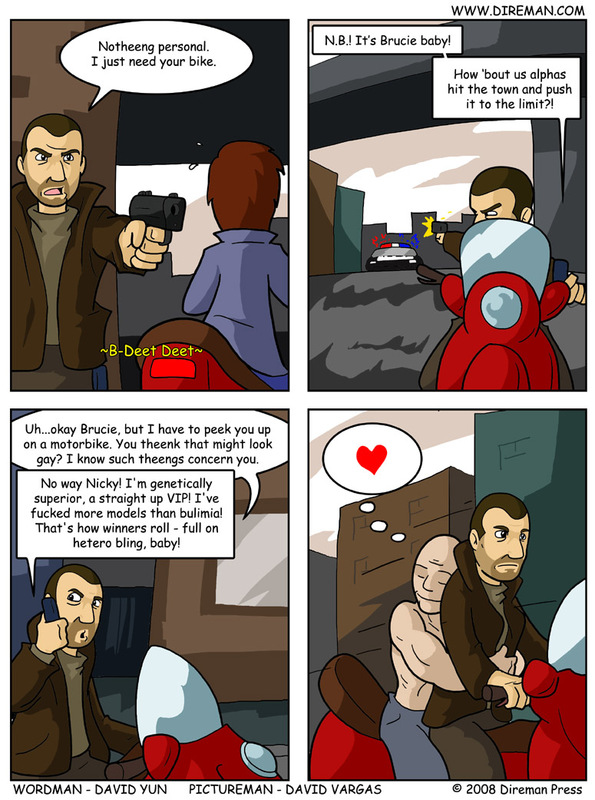 I *think* this is the last GTA IV strip, but I reserve the right to continue The Adventures of Niko the Carjacker. Website is © 2005-2008 Direman Press. All content is © their respective creators. All rights reserved.